The timeless fiction of Louis L'Amour is both unforgettable and undeniably American, deftly capturing the heroic bravery and intrepid spirit that make this nation great. L’Amour ’s legacy of work remains unparalleled, setting a standard of excellence that few other writers have matched. 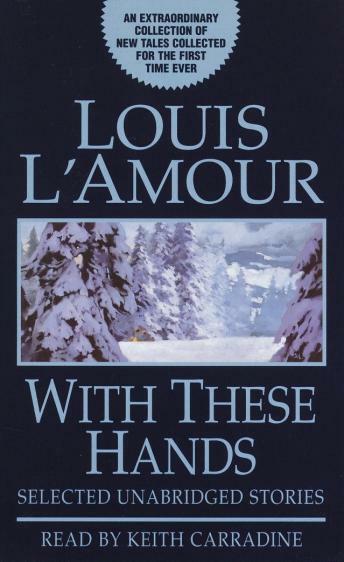 Now With These Hands pulls together some of L’Amour's very best work--eleven newly rediscovered stories that have never before appeared in a single volume. From a South Seas island paradise to the icy reaches of the Arctic, from the dark, gritty streets of urban America to the rugged landscape of the untamed West, the stories gathered in With These Hands combine razor-sharp characters with breathtaking action and historic detail. Here are tales of adventure, mystery, passion, suspense, and the Old West as only L’Amour can tell them. The result is a collection that profoundly echoes the highs and lows of the human experience, while proving that life’s most vital moments can occur when and where we least expect them. All of the classic L’Amour themes are represented: honor, loyalty, and standing up for what’s right despite the odds. These dramatic stories grab hold of the reader with a power and immediacy unsurpassed by any other writer. An exotic island in the Coral Sea is transformed into a tropical nightmare when it’s taken over by a band of hijackers--and only a daredevil pilot can stop their brutal carnage. A former boxer blows the lid off a vicious crime ring--and finds that his worst enemy is not a thug with a gun but his own tenacious curiosity. A down-on-his-luck rancher discovers the key to his own redemption--and desperately hopes that his revelation has not come too late for him to win the one thing he wants most of all. A private eye navigates the twists and turns of a labyrinthine whodunit--and proves that the greatest risk to a man’s honor is his own greed. The title story “With These Hands” is a powerful tale that celebrates the triumph of the human spirit, as an oil company executive finds himself the sole survivor of an Arctic plane crash. Fighting for his life against the perilous cold and looming starvation, he resists the temptation to surrender to death--only to discover a life-affirming strength he never knew he had. Vivid in scope and displaying the diverse talents of a master storyteller, the stories in With These Hands are certain to be treasured by both old and new fans, celebrating the incomparable imagination of a timeless American author.